Just being around Fady Joudah causes my brain to operate in lyric, to think in snatches of poetry as ephemeral as they are light. Simple phrases formulating in my head about the most ordinary things become filaments of verse, appearing in my mind’s eye as I think them and then disintegrating to make way for the next fragment at such a rapid pace I can’t even stop long enough to write them down. Suddenly a simple self-command such as “park the car on that side of the street” becomes a metaphor: the busy downtown street is now a rainy gulf teeming with waves of traffic, my car a tiny craft pitching forward to a parking meter that in my imagination faintly resembles a dock strewn with fallen flowers. Sometimes I wonder, if this is the effect he has on other people, what must it be like to live inside his brain? 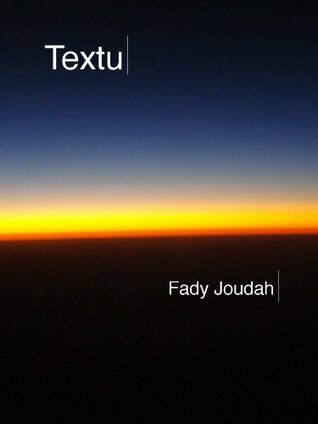 Fady’s Textu (published by Copper Canyon Press) is a collection of short form poetry launched only as an e-book, in part due to the nature of the genesis of the form: the poems in this collection conform to the length of a text message, exactly 160 characters, each poem determined in part by character count. The first thing I thought when I began reading them was, My students will love this. So many of them feel intimidated when I ask them to write a poem. For so many of them, the stormy chasm between poetry and their comfort with and understanding of it might as well be filled with basilisks. But ask them to write a text message with an unusual image in it? That, they can do. Enter Textu, and suddenly poetry becomes more accessible because it feels familiar. The e-book format is also inviting, since on an e-reader, every book is just a file of words, a novel is the same size and weight as a mechanical engineering tome, the same as a novella, the same as a short story, the same as a collection of verse. There is nothing unfamiliar about e-book files because — despite the obvious differences in formatting once you get into them — they are all alike subconsciously, and therefore – take this leap with me — one does not feel the Otherness of poetry in an environment where poetry is not read enough. I asked Fady once about how he came up with the idea for the Textu form, which plays on the words “text you” and “haiku.” He said it came from noticing how much time people spend texting. Time constraints? Anxiety about not being able to spend enough time on one’s manuscripts? I can relate. I began writing what I call “short form debriefs” because of this very problem. It’s been helpful. Rather than strive to craft a longer poem about Lots Of Big And Important Ideas, take a single moment and fill it with highly developed imagery and a single specific idea. I shared this method with my students, too. The response? This is good, this is satisfying. Focusing on the entertainment of the evolving antique expression and pun distracts me from the real sensuality of the poem, so that when I arrive at the last couplet I feel surprised. I remember the title of the poem. I remember that I love figs. I bring a myriad of associations to the experience of reading the poem, some innocent and tender from hours spent playing under and harvesting from the fig tree as tall as my childhood home in the corner of our backyard, to the chapter of fig recipes in an aphrodisiac cookbook on my kitchen bookshelf. The poem invites me to play. In his poem “Eurydice,” he eliminates the myth from the Greek story, thereby humanizing what might have been a distant, academic anecdote. I love to teach this poem, along with Seamus Heaney’s “The Underground,” as an example of the myth poem. What could feel more heartbreaking than the inaccessibility of one person – lover, parent, child, moody BFF – to another? And who doesn’t understand that? The myth has been made personal, just as the Textu form has made poetry personal to an audience so far removed from “Dover Beach” and “Dulce et decorum est” that verse had become anathema. Fady similarly re-introduces Ariadne, Penelope, Scheherezade, Zeus, Abraham. The poems in this collection touch on more than love, of course. There are politics, medicine, the struggle for an understanding of how our systems of government and the labels we use for them confound us, thoughtful questions on the nature of poetry itself, open text messages to old masters of letters – explorations which, for me at least, cannot be separated from the poet who writes about them. Fady incorporates the modern vernacular of an age both scientific and technological into stunning images as light and ephemeral as the filaments of poetry I can’t help but think and yet not fully grasp when I am around him. Love occurs in Textu in so many different ways. Near the beginning and end of the collection we have poems of romantic love, as if suggesting that such a thing can envelop a person, can ground one in both reality and lyric. This, like the accessibility of the form to people who are terrified of writing poetry themselves, comforts and energizes the reader/writer/student poet. The familiarity of the form Fady has codified makes poetry a real thing, an integral thing, a seemingly easy thing to attempt, while the poems in Textu are yet finely wrought. I challenge you to read this collection and then not feel moved to compose one yourself. Start small. You have 160 characters. Don’t worry about punctuation. Play. N.b. In this review I refer to the poet by his first name because he is a personal friend of mine, and because I don’t call him by his last name. This may count as a disclaimer for my endorsement of the book, if you like, if that matters to you, but understand that even if I didn’t know him, I wouldn’t change any portion of my opinions here. Textu is a lovely and worthwhile addition to any personal library. The poems and quote I’ve used here have been used with Fady’s permission. Congratulations to Surajvinay, the winner of this month’s short form poetry contest by an impressive margin. Thank you to everyone who voted! Surajvinay, please be sure to email me with your address so I can send your prize, a copy of Strange New Words by Ari Marmell.